It’s official and undeniable: outright censorship is here. But we can’t say that anymore. It’s 100% blatantly obvious now. And I believe it has been in the works for 5 years. Similar to the frog in the pot, they’ve been turning up the heat slowly and we didn’t notice. Until now…when (if we didn’t have a plan) it’s too late. Luckily we do have a plan…so keep reading until the end! I honestly believe this started back in 2013. In the fall of that year, I had been blogging for just about 4 years. I was connecting with lots of others and social media was becoming really popular. My Facebook page was growing by leaps and bounds…sometimes hundreds of new ‘likes’ every day! I honestly believe, looking back, that this was organic growth, driven by a strong interest in organic/natural information — I wasn’t the only one seeing this kind of growth at this time. In December that year, it all suddenly stopped. The social platforms had gotten large enough to demand that the very people that had built their platform and created communities pay to reach the followers they had brought in! Of course, I stupidly continued to invest in these platforms and tried to play their game…only to end up here. 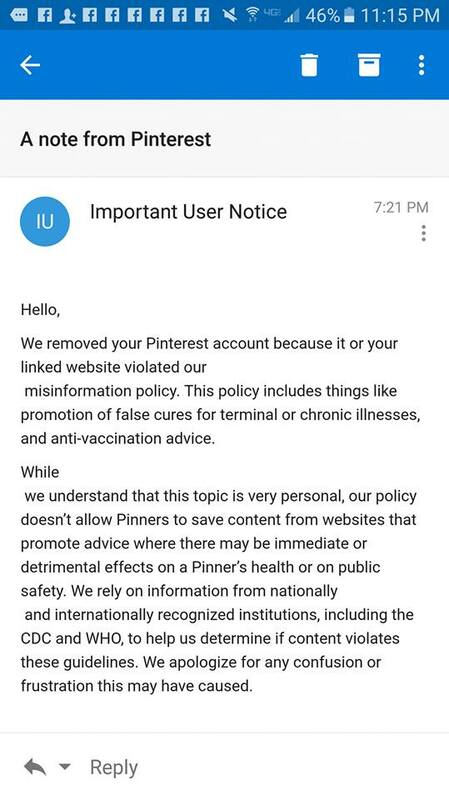 In September, Pinterest changed their “Community Guidelines” to say that they no longer allow anti-vaccination advice on their platform. You can see that HERE. Shortly after, they began to delete individual pins and boards that continued this type of information…also, other natural remedies, essential oils, and other natural health advice. Self-harm. They called it self-harm. Does anyone else think that’s completely ridiculous? Then, last night (December 13), I got this email. My entire account, with over 17,000 followers, is gone. If anyone knows of others, please let me know in the comments and I’ll add them to the list. Here’s the thing. I don’t care if a platform starts up and says “This is what we’re about, and not about.” Companies have the right to stand for whatever they want. It’s all about the money, and what they want — not protecting the rights of users to access the content they actually want to see. 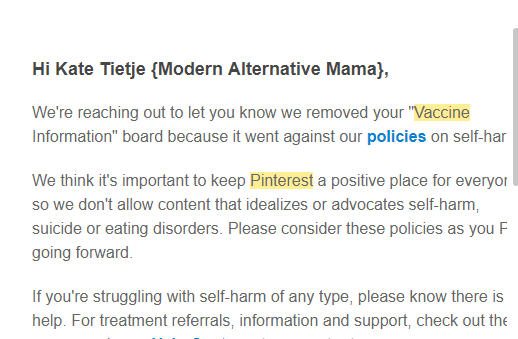 How I wish I could say that Pinterest was the only platform doing this! But I can’t. Facebook, too, has engaged in censorship. It’s not quite as blatant yet, but they’ve gone on delete-sprees of natural pages — without warning. You can read more about that, and see a full list of affected pages HERE. This is, of course, in addition to massively limiting the reach of natural-minded pages. Most such pages have to struggle to get even a few hundred people to see their posts, even if they have tens of thousands of followers (like me). It has nothing to do with the quality of their content or how many people would want to see it; it’s Facebook’s decision to limit the reach. I haven’t seen this happen a lot on Instagram yet, but I’m sure it will. Facebook owns Instagram. YouTube has straight-up deleted a few of the more ‘extreme’ alternative channels, so it’s coming there, too. And, it gets worse. It’s not just social media. Somewhere around 2015, Google quietly began making algorithm changes that would push mainstream-aligned pages to the top of their results, and other pages down. They call certain types of pages YMYL, or “Your Money or Your Life.” What this means is that certain types of information, if incorrect, could be potentially harmful to users. This includes financial advice, legal advice, and medical topics — i.e. anything health-related. The problem lies in where they choose to draw the line. What constitutes “acceptable” information? Google has a cute little acronym to describe how they figure it out. E-A-T. Expertise, Authoritativeness, and Trustworthiness. Essentially, if the person who owns the website is considered an “expert” in the field by mainstream standards (degrees, awards, experience), the page is ranked higher. You can read more about google’s rankings HERE. This has nothing to do with making sure people are qualified to share information, or making sure that information is based on good sources or experiences. This is about pushing a mainstream narrative at any cost, and “saving people” from themselves. The powers-that-be think you are too stupid to decide if you should trust a source or take advice from someone on your own. Lest you think this hasn’t crossed the line yet, check out THIS BILL in California. They actually want the government to get involved in monitoring social media. This actually would be a violation of free speech because it’s the government. Are you paying attention yet?! If social media and google were really about the people, then they would design their algorithms in such a way that whatever the people were sharing and reading the most, would get bumped to the top of the newsfeeds and search results. The people would have a clear voice in driving what did and didn’t get seen. And that’s fair. Some companies or websites would not have a voice because the majority didn’t find it to be useful. And that’s fine, they don’t have to use any particular website and they can ignore voices that don’t resonate with them. This is about companies gaining power and growing rich, and misusing that power to manipulate what information and ideas others access. They want to make sure people see what they believe is right, and that people think that everyone around them agrees with these ideas — even if they actually don’t. I truly believe that in 2013, when the natural and organic markets (food, clothes, supplements, information) were exploding, if it had not been manipulated, it would be much larger now than it is. It’s still growing at twice the rate of mainstream companies, even with the manipulation. This has been going on forever, essentially. Since the beginning of recorded history, those in power controlled the official narrative. The internet was the first chance we had to change that power imbalance and allow the people to control what information they actually wanted and share truth with each other. And it has been badly co-opted and used by people with no morals and no souls. They will tell you that they mean well. That it’s about controlling “fake news” and making sure that people don’t hurt themselves with poor advice. But that’s just saying that the population is unable to think critically and unable to decide for themselves what to listen to and what choices to make. Do you really trust people who want to limit your choices and force things onto you because they think so little of you? Some people are (understandably!) angry and want to appeal to Pinterest or Facebook, or even try to sue them. No, the only way to beat the system is to refuse to participate in it. Many people are already deleting their Pinterest accounts, and after Zuckerberg was brought to testify about privacy violations in front of Congress, millenials largely stopped using Facebook. Change is happening. We’re going to help that along. We’re starting our own social media-content hybrid site. It’s called Colleqtiv, because the community will run it — not a few people with too much power. At Colleqtiv, the main focus is community. There will be groups on lots of different topics, including healthy eating, babywearing, breastfeeding, parenting, natural health research, and more. Members will be able to join whatever groups interest them, and share ideas with each other. Additionally, there will be a ‘learning’ space in Colleqtiv, where we have a variety of different articles on popular topics, linking to research and to well-written posts on other blogs and platforms, so that people can learn more. Members will be able to share and discuss these and community mods will add to them over time. Every post, in every community, can get voted up or down (and so can every comment). The most helpful posts and comments will show up first, as decided by the people! If someone is participating in the community negatively, the people can vote their comments down or report them, and the mods/admin will step in based on the will of the community. Basically, it’s an actual community. And that will not change. It’s too important to us to have a safe space for natural-minded people, where they’re actually welcome and have a say in what happens. And I’ll just be clear up front. While the platform will be open to everyone, and we want people who are in any place in their natural living journey (or who are interested in only one aspect of natural living), it will not be open to those who are staunchly mainstream and think natural living is dumb. i.e. if you hate what we stand for here on the blog…this new site isn’t for you. My guess is that 80% of people will fit in great, because they either have some interest in natural living or believe “to each his own” and that’s cool. Those 20-ish% of anti-natural people are the ones we aren’t interested in serving. We’re in pre-launch right now, but hope to have the live site finished and ready for an official launch in spring 2019. Who’s ready to move away from mainstream social media?! I can’t wait for Colleqtiv!!! Another respectable site not allowed on Pinterest is: GreenMedInfo.com by Sayer Ji. Includes a tremendous research site, some of it free. http://www.greenmedinfo.com/research-dashboard. The Breastfeeding group that I used to admin on Facebook was deleted without any notice in 2013. That’s another natural group that was affected when FB started their censorship. My instinct tells me that the online tech companies are being pressured or perhaps compensated by Big Pharma and other groups who want to ensure that public discourse via tech media is censored. Pinterest, Google, Facebook and the like are using their power to censor what is available to read, plain and simple.